Organizations are facing larger and more frequent changes in the current economic climate. A changing marketplace, empowered workforce and technological advancements have created an environment where change is now a part of everyday business. In this environment, organizations are beginning to recognize the importance of building the competency to rapidly and successfully change. Prosci’s Change Management Maturity Model, based on benchmarking research, describes the varying levels of change management capability across organizations. The maturity model has five levels, from no change management to organizational competency. Each level involves more attention and management of the people side of change. Below is a detailed explanation of each level as well as the action steps your organization can take to move to the next level of the model. The tutorial concludes with research data on Maturity Model levels from Best Practices in Change Management – 2016 Edition. At Level 1 of the organizational change management maturity model, project teams are not aware of change management and do not consider it as a formal approach for managing the people side of change. Use at the Project Level: Change management is applied on a project only as a last resort when employee resistance jeopardizes the success of the project. Change management is reactive and an add-on to the project. No integration with project management takes place at the beginning of the project. In Level 2, elements of change management begin to emerge in isolated parts of the organization. The effort to manage the people side of change is infrequent and is not centralized. In Level 2, projects apply change management when resistance emerges or when the project nears implementation. Only isolated projects use change management at the beginning of their project. Some elements of communication planning occur early in the lifecycle. At this stage, change management is not fully integrated into project management. On projects that use change management, the project team is aware and knowledgeable of change management. In certain instances, a change management advocate can encourage the integration of change management and project management. At Level 3, groups emerge that begin using a structured change management process. Change management is still localized to particular teams or areas in the organization. Change management is initiated at the start of some projects, with a large fraction still applying change management as a reaction to employee resistance during implementation. Teams who are successful at change management integrate change management with their overall project management methodology at the inception of the project, including communication and other change management plans. 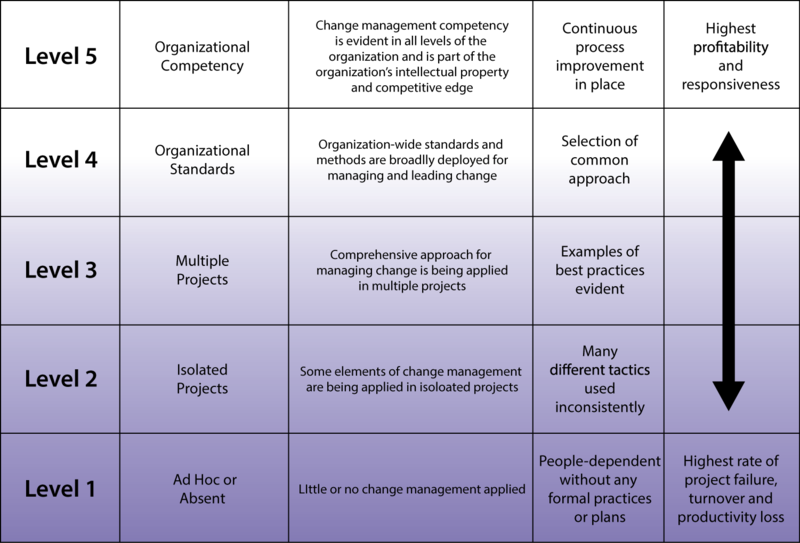 In Level 4, the organization has selected a common approach and implemented standards for using change management on every new project or change. Note: a common methodology does not mean a one-size-fits-all recipe; effective methodologies use repeatable steps, but they work best when tailored to the specific needs of every project. At Level 4, teams regularly use a change management approach from the beginning of their project, with change management work included in the planning phase of the project. As the project progresses, project management and change management continue to integrate to the point where they are not separable. Project teams follow both project and change management milestones. In Level 5 change management maturity, change management competency is part of the skill set of the organization. When organizations have developed a high level of change management competency, change management steps are completely integrated into project management, and change management work begins before the project kicks off. Planning and design phases have both project and change management elements and are viewed as standard practice. 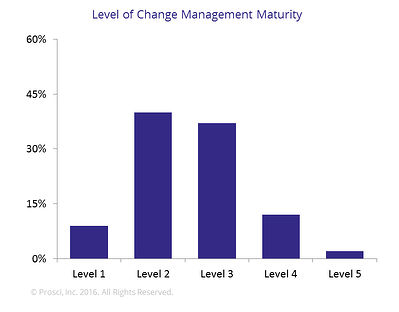 In Prosci's Best Practices in Change Management - 2016 Edition, participants identified where they were on the Change Management Maturity Model. Just under half of participants (49%) fell at Level 1 (Ad hoc or absent change management) or Level 2 (change management on isolated projects). Only 14% were at Level 4 or Level 5, where the organization had truly begun adopting organizational standards and building organizational competencies. Moving up the Change Management Maturity Model improves how an organization operates and performs during times of change. There is a growing body of knowledge that shows a direct correlation between how well an organization manages the people side of change and how successful projects and initiatives ultimately are. As an organization sees examples of failed changes due to poorly managed change and successes due to effectively managed change, there is a greater sense of urgency related to moving up the Maturity Model. Building an enterprise-wide change management capability improves agility, mitigates saturation and improves change portfolio outcomes. But an enterprise capability takes more than “want to” and chatter. 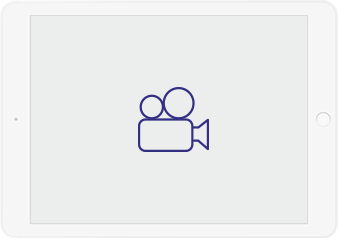 In this session, learn how to bring structure and intent to building your change management capabilities.